What else will Greece face in the wake of Troika’s financial reform package? “One of the preconditions imposed on Greece for a deal is that it signs into law European rules that would put euro zone authorities at the ECB and in Brussels, rather than Athens, in charge of identifying and closing or breaking up sick banks. With Greece having its third bailout in five years, the hopes of leaving the eurozone are all but shattered at the moment, as they face a worse financial situation – one which could see more social upheaval and political divide in the near future. 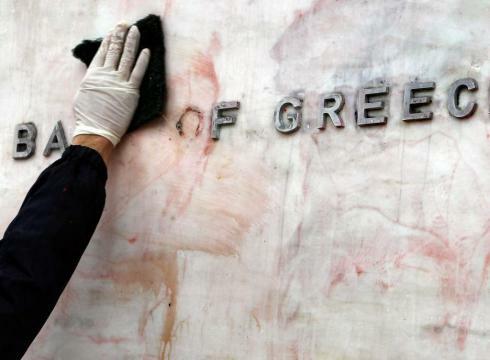 ‘Blood Money’ – Greece seems set to incur a serious recession with another banker bailout. After having launched a Referendum to refute and refuse the debt bailout agreement put together by the Troika, Prime Minister Tsipras together with his newly instated Finance Minister, comes up four days latter with an austerity package broadly similar to the one which was turned down by the Greek government in June. This about-turn had been carefully engineered. The Greek people were misled and deceived. The Referendum was an outright ”ritual of democracy”. Tsipras had made a deal with the creditors. He was in favor of accepting the demands of the creditors all along. 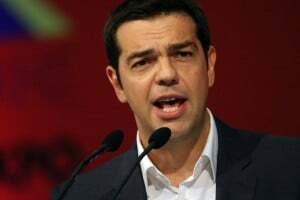 Tsipras led the “NO” campaign while having already decided that in the wake of the Referendum, he would say YES to the creditors and cave in to their demands. This is tantamount to an Act of Treason. There was no attempt by the Tsipras government in the immediate wake of the Referendum to renegotiate or extend the deadline on behalf of the Greek people in response to the NO Vote. On Monday morning, the day following the Referendum, Yanis Varoufakis who had led the negotiations with the Troika resigned as Finance minister. Did he wilfully resign or was he “dismissed” to facilitate an agreement with the Troika? Creditors are known to influence appointments to key ministerial positions.(e.g. South Korea, December 1997 at the height of the Asian Crisis, the Finance minister and the Head of the Central Bank are dismissed on the orders of Washington). Varoufakis was hastily replaced by Euclid Tsakalotos, who took office on Monday morning. His appointment as Finance Minister and chief negotiator (which must have been known well in advance) was broadly welcomed by the EU political and financial establishment. Tsipras later told Parliament that his government had been forced to cave in to the demands of the creditors. He also said that the referendum did not authorise the government to envisage the Grexit, namely an exit from the eurozone. What he failed to mention is that the NO Vote gave him a political mandate to renegotiate the deal on behalf of the Greek people with a view to at least alleviating the deadly impacts of the proposed austerity measures. By Thursday, a document of 13-pages containing concrete reforms and austerity measures was sent to the Troika. The initiative was intended, according to media reports ”to act as a foundation to free up a new three-year, 53.5-billion euro bailout package to save the nation from bankruptcy”. Moreover, special tax breaks for the country’s islands — popular tourist magnets — will be scrapped. Only the most remote islands will get to keep the coveted tax breaks. Amendments on insolvency laws will aim to get debtors to pay up loans, while consultants will help on how to deal with bad loans. Steps will also be taken get foreign investors to pour their money into Greek banks. The government will open restricted professions such as engineers, notaries and court bailiffs. It will draw up laws aimed at getting rid of red tape and making it easier to get business licenses, while reforming the gas market. What is not explicitly mentioned in the 13 page document is the logic of “vulture investment”, leading to the eventual demise of “Greek capitalism” including its banking and commercial shipping industry. (The essential elements of both the joint statement and the 13 page document were no doubt drafted prior to the Referendum). The Troika is acting on behalf of the creditor institutions. They do not call the shots. The ECB is integrated by individuals who are in close liaison with major banking interests including JP Morgan Chase, Deutsche Bank and Goldman Sachs. Similarly, the Washington based IMF (which essentially is a debt collecting bureaucracy) is part of what is called the Washington consensus, with links to the US Treasury, Washington’s economic think tanks and of course Wall Street.